To manage your equipment & space booking settings, go to Admin > Equipment & Spaces > Settings. 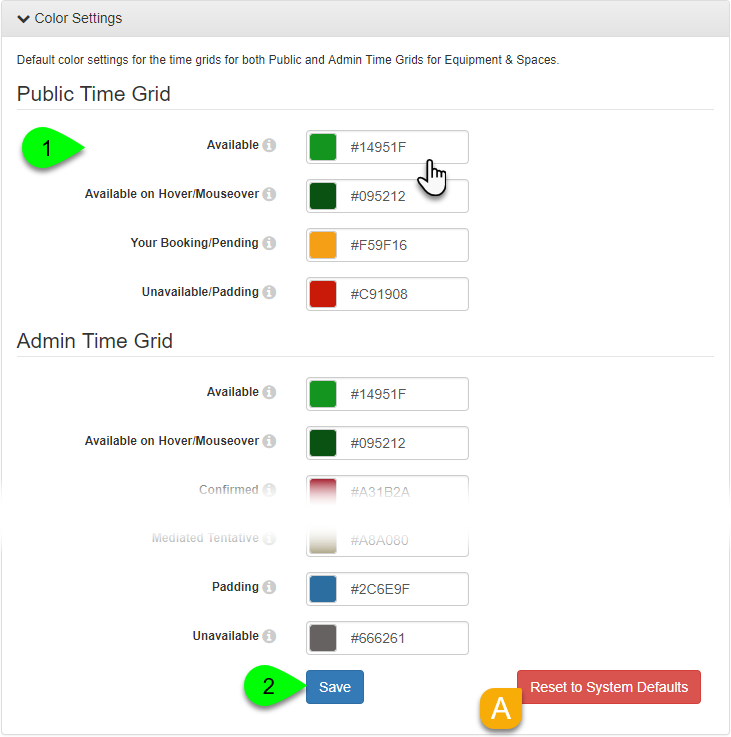 The Color Settings allow you to customize the colors used in the availability grids for Equipment & Spaces. Not only will this give you control over the colors used on the public booking pages, but it will also allow you to customize the colors used on the admin side of LibCal, as well. Use the color pickers to select your preferred color for each booking status. Alternatively, if you already have a hex code picked out, you can enter it directly into a field. When finished, click the Save button to apply your changes. If you ever want to start over, just click the Reset to System Defaults button (don't forget to Save, too! ).